If you go into One of Us is Lying expecting a Gillian Flynn-worthy mystery, you’ll be disappointed. But if you adjust your expectations and think of it as a better written Pretty Little Liars with a bunch of likable, relatable characters, then you’ll probably enjoy it a lot. I didn’t initially get into it with the right mentally, but after a few pages I already knew where the mystery was going—it was pretty obvious—and I got the PLL vibe, so I changed my perspective. That was crucial, and I ended up liking this book. 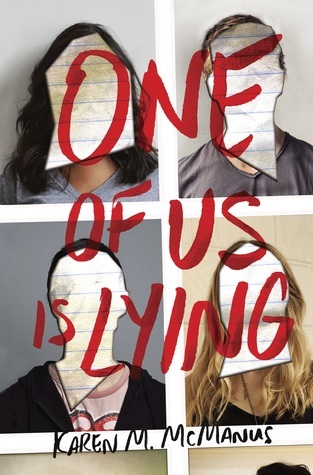 One of Us is Lying is the story of 4 high school kids who find themselves involved in a murder investigation after one of their classmates is poisoned and dies in front of them. We have Bronwyn (the super smart daughter of an immigrant), Addy (the beautiful girl whose life goal is to marry her high school sweetheart), Cooper (the baseball star) and Nate (the drug dealer). You might grimace at the stereotypes, but that’s what makes this story interesting. Not exactly that, but how this author manages to take these characters from the tiny boxes they’ve been put into and make them something more. Give them flaws and personality traits and a future. For me, One of Us is Lying was about these four kids and what they made me feel. And they did make me feel a whole lot. I blame the four POVs for how the mystery part of the book fell apart. Being inside the head of these four main characters didn’t allow for much suspense, which hurt the mystery element. In all honesty, the title and the way the book was market gave the vibe this was going to be a mystery/thriller, but this book is, in its core, a contemporary. But the four POVs worked for me because they allowed me to get to know and connect with these characters. Sure the POVs sounded pretty much the same—the voices weren’t distinctive at all, but I still didn’t mind them because I like (and sometimes LOVED) the story being told. I fell in love with all four characters, and I rooted for them. Bronwyn was probably the first one I connected with. She was smart and had enough pressure on her with all that had happened with her sister and her parents, and she sounded genuine enough to pull me in instantly. No surprise I also fell for Nate instantly. This is the third book I read this year with a drug dealer as a main character, and I always end up rooting for them. Don’t know what that says about me. And obviously, I jumped on board as soon as that became a ship. Or even before that. Now, Cooper and Addy took a little warming up to. The first because he wasn’t giving me much, and because I pretty much knew what the big secret he was keeping was (again, the mystery didn’t work for me). The second, because I spent half the time wanting to slap some sense into Addy at first. But I have to say that Addy won me over in a way that she ended up being my favorite character in this story. Her arc was the strongest one, in my opinion, and she turned into such a beautiful character in the end that I wanted to hug her. I loved, loved how these people went from virtual strangers to close friends. That was probably my favorite part of the book. Something Addy said resonated with me a lot: you find out who your true friends are when things get tough, and I thought that was what happened here. Something else I adored was the romance. It wasn’t a huge part of the plot, but it was big enough to be important, and it was well-developed. I shipped all the couples (especially Bronwyn and Nate) and loved the direction things went toward the end for all the couples featured in the story. So, while the mystery and everything involving Simon didn’t impress me, the bond Cooper, Addy, Bronwyn and Nate formed did. So did their individual stories. My PLL feelings were alive, and I was happy for it.